Want to see how Columbus does mobile food? 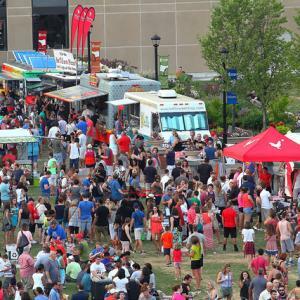 More than 50 food trucks will be featured at the 7th annual Columbus Food Truck Festival on Friday and Saturday, August 18 and 19 from 11 a.m. to 11 p.m. 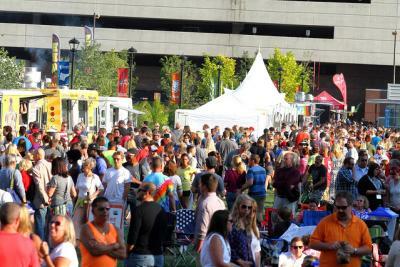 This year the festival has moved to the beautiful downtown riverfront on the Scioto Mile and in Bicentennial Park. Food trucks and beverage vendors will be spread along the east and west sides of the river and across the Rich Street Bridge. Nearly every style of food will be represented, from pizza and tacos to gyros and barbecue, Hawaiian poke to fried chicken, ice cream to popsicles. And there’s more than just food available! Two stages of live music – the Bicentennial Stage and the Washington Street Stage – will feature performances from Columbus bands like Doc Robinson, The Deeptones, Popgun, and Nick D & The Believers. Both adult and kid-friendly beverages will be available throughout the festival grounds. A collection of Columbus crafters will be showcasing and selling their work along Washington Boulevard on the west side of the river. Visit the Bicentennial Stage at 3 p.m. on Saturday to hear the winners of the Best Food Truck Awards! Festival guests can pre-purchase their parking through the festival website, and a secure bike corral is available. And don’t forget you can ride the free CBUS circulator to the festival! 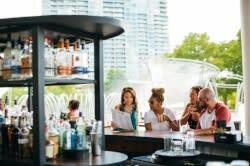 Check out columbusfoodtruckfest.com for parking suggestions, the full line-up of live music, and a complete list of food trucks! Note: These photos are from last year, when the festival took place at Columbus Commons.